THE City of Windhoek yesterday entered into a twinning partnership agreement with Kingston city of Jamaica – a first for Namibia within the Caribbean region which will seek to promote and strengthen friendly relations and cooperation between the two states. 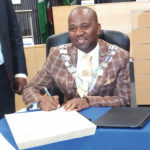 Speaking at the signing agreement, CoW Mayor Muesee Kazapua said that twinning agreement will encourage stronger trade and investment cooperations in key sectors that will be mutually beneficial to both cities. “This agreement should create and establish a mutually beneficial partnership and indeed create a conducive environment for collaborations in areas identified within the agreement; and future arrangements as and when need arise,” he said. Kazapua said that “no city exists in isolation” and such cooperations are needed to create networks, for sharing good practices and good local governance. “We recognise and appreciate that we are interdependent and need to work together to finding working solutions to common challenges that faces our respective peoples; through sharing of experiences and knowledge,” he said. Mayor of Kingston, Senator Delroy Williams, concurred that the fusion between the two cities will benefit the people in areas of creativity and digital technology. Williams also noted that the challenge of informal housing in also an issue in Jamaica, with many residents of Kingston struggling to get proper housing. “We also have similar experiences of housing in Kingston and as cities, we have to look at housing as not just providing houses to our people but to create a robust healthy housing plan to our people,” he said.